Do you want to read this blog now or would you prefer to do something else in this moment? In this blog, I am going to talk about ‘ I HAVE TO’ versus ‘I WANT TO’. I will give you 7 tips that will support you in moving from “I have to” to “I want to”. This will allow you to create more lightness, energy, ease, playfulness, and creativity in your daily life. One of the causes of stress, tension, and burnout is the “I have to’s" that we impose ourselves. It has indeed become the most natural thing in the world to do. The first question we often ask ourselves when waking up is: What do I have to do today? We stand up and are fully focused on our agenda, responsibilities, and the to-do list. This focus ensures that we end up in a daily routine. Completing the tasks on our to-do list then becomes our highest priority and motivation. The risk is that while we perform this routine we experience little to no pleasure, satisfaction, and inspiration. Our soul is not really involved in carrying out these routines so that what we do often feels empty and inanimate. Do you recognize this? At the beginning of 2017, I realized that my main “engine” was still that of "I must", even though I knew better. Driven by fear and expectations. The fear of rejection, the fear of failure, the fear of not being good enough, the fear of having too little time, the fear of scarcity, etc. This banned the fun, joy, creativity, and playfulness out of my work and life. It was a painful realization, but an important one. This insight has ensured that I could make a change. Step by step I moved in the direction of my true wishes, desires and my inspired WILL. I HAVE TO is connected with the ego and with our (limiting) beliefs and fears. It evokes resistance and tension. If someone tells you to do something, you often don’t feel excited, but resistant. When we choose to do something we don’t want we actually give away our authority and power to fear. We follow something that’s not in alignment with ourselves. If it was really aligned with our hearts, we would have wanted it, right?! I WANT TO is connected with an internal motivation, it’s then in alignment with that that’s truly in alignment with you, with your being and what is "true" for you and what truly wants to happen in the moment. It flows, evokes energy, and fun. It feels light, easy, and you immediately feel like acting on it. Starting something you want to do flows, and with “having to” you have to make yourself do it, which costs a lot of energy. Your body is a very honest and wise compass that clearly indicates when you ‘want to’ or ‘have to’ do something. When you want to do something, you will notice that you are relaxed, positive, happy, energetic, and involved. When you have to do something you often feel heavy, tense, tired, in a rut, and empty. It is not strange that you will feel tired and eventually burned-out. If you have lived for a long time with “I have to" as your “engine”, it can sometimes be difficult to receive and feel an answer to the question: What do I want? If this applies to you, I would first like to invite you to ask yourself the "what do I want?” question several times a day. If you do not get an answer right away, that is not a problem. By asking the question alone you create the space for your heart to speak. Eventually, you will receive and feel the answer. Below I would like to share 7 tips with you to allow more “I want to", and therefore energy, into your life and to follow the path of least resistance. 1 - Align yourself with your body and perceive the sensations in your body without judgment. Do you feel tension or relaxation with what you are doing or have planned to do? 2 - Watch your words when you speak. How often do you use the words “I must" or "I have to"? 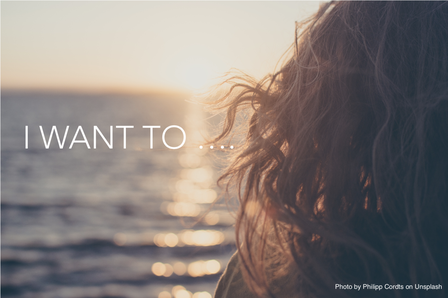 Let these words be a reminder that you have a choice and that you can move towards “I want to”. 3 - Ask yourself regularly during the (working) day: What do I want (now)? When you are done with a task, take a moment to feel what you want to do now. And don’t be surprised when it is something that does not fit your "planning". Dare to follow it with the knowing that your to-do list will be taken care of in natural divine timing. 4 - Make a list of the things that you "must" do today and choose the one you want to do in this moment. Which task evokes excitement? What task resonates fun, ease and "I feel like it"? And start with that task. 5 - Allow yourself to have fun in what you do. Sometimes it happens that you really have to do something because it really cannot wait. Allow yourself to do this task in a way that brings pleasure. What can you change in the way you do it so that you receive lightness, playfulness, and energy from it? 6 - Does something evoke resistance? Or have you started a task and suddenly feel resistance towards it? Follow the path of least resistance. Choose something else to do. There is another moment that will automatically arise where you feel like doing what you are now feeling resistant to. Good luck! and if you want to share your experiences, then I would love to hear from you!